It was a game that alternately illustrated how little margin for error the Seahawks have each week while also vastly decreasing the margin for error they have for the season. Seattle’s playoff odds heading into the game Sunday against the Chargers were 55 percent, according to FiveThirtyEight.com. But after a frustrating 25-17 loss to the Chargers, those odds decreased to 33 percent, with Seattle falling from sixth in the NFC playoff picture to eighth. And now comes a road game against a Rams team coming off its first defeat of the season, a contest that Seattle won’t come close to winning if it makes as many mistakes as it did against the Chargers. Here are some grades on a game the Seahawks will be kicking themselves about all season. Russell Wilson, who had been so good the past few weeks, was more mortal for most of the game Sunday, misfiring on two third-down passes to open receivers — including a potential touchdown to Jaron Brown in the third quarter — on a day when Seattle knew it would need to take advantage of every opportunity to keep up with the Chargers. And then there was the killer pick-six in the fourth quarter. Wilson finished with his second-lowest passer rating of the season (89.2), with the Chicago game — which also included a fourth-quarter pick six — the only one lower (86.1). Chris Carson had some good moments early but then left the game midway through the second quarter due to a hip injury. He watched the rest of the game from the sideline with his leg heavily wrapped. Mike Davis filled in ably enough with 62 yards on 15 carries. But rookie Rashaad Penny had another tough day (11 yards on four carries). For whatever reason — probably a variety of play-calling, protection and receivers not getting open — Seattle didn’t get the kind of consistent big plays in the passing game Sunday as it had in previous weeks. Doug Baldwin had a reception for 42 yards but no other receiver had a play of longer than 11, with Tyler Lockett getting just 22 yards on three receptions and David Moore finishing with just two catches on seven targets for 16 yards. And while the last play was a really tough one, it was the kind the Seahawks needed to win this one. Nick Vannett had six receptions on a eight targets for 52 yards and a touchdown. But Ed Dickson was nonexistent in the passing game after his breakout last week with no receptions on just one target. The running-game numbers were again solid — Seattle averaged 4.8 yards per carry. But the protection wasn’t what it had been the past few weeks. Wilson was sacked four times, the most since the Week 2 defeat against the Bears. Seattle’s also hoping D.J. Fluker, who was sidelined in the second half with a calf injury, will be able to make it back against the Rams. Joey Hunt filled in for Fluker but Seattle could also go to Ethan Pocic, if needed. Pocic was not active Sunday. Seattle allowed 7.3 yards per carry and sacked Philip Rivers just twice. Rivers, of course, is hard to get to, having been sacked just nine times this season. But Seattle coach Pete Carroll said later it needed to be better. “We didn’t get to the quarterback enough,’’ he said. Jarran Reed and Frank Clark had the sacks, continuing their consistent play this season. But Seattle needs more pass rush from some of the others. The running-game numbers speak to what were some issues, especially early — the Chargers averaged 10.6 yards per carry in the first half, gaining 85 yards on eight plays (28 by receiver Keenan Allen). 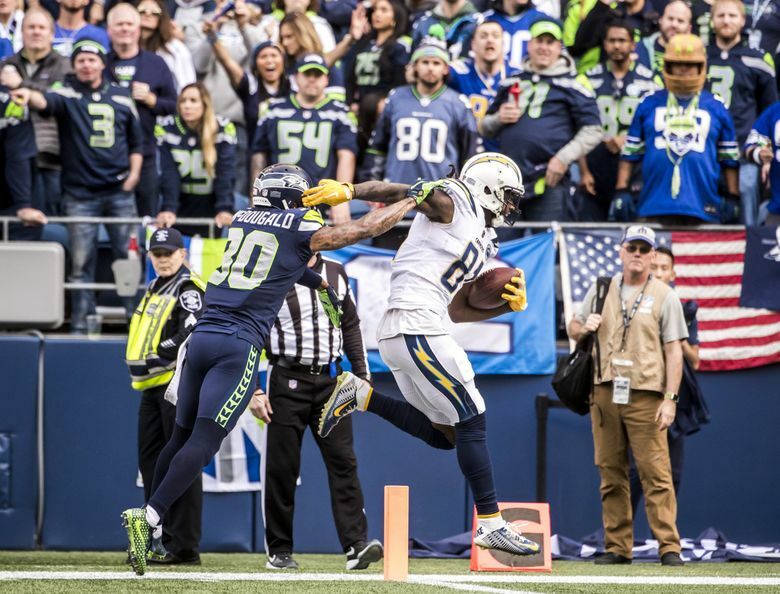 But the Seahawks held the Chargers without an offensive point in the second half, with the play of Bobby Wagner and K.J. Wright a key in that. Despite some of the big numbers for some of the Chargers, the Seattle defense played well enough to win the game, particularly in the second half — Rivers was just 4 for 9 for 64 yards in the second half (granted, the Chargers were ahead and content to run the ball more often). Seattle played much of the second half without Bradley McDougald, giving Delano Hill his most significant playing time of his career, and if the stats mean anything, playing well enough. This is where the Seahawks almost won the game with punter Michael Dickson having one of his best games — an average net of 50 yards on six punts, downing four inside the 20, with a long of 61. Tyler Lockett’s 34-yard kickoff return also gave Seattle life following the pick-six that made it 25-10. And Chargers kicker Caleb Sturgis missed two PATs and a 42-yard field goal while Sebastian Janikowski was 1 for 2 and made both his extra-point attempts. The Seahawks, though, couldn’t get an onside kick after their final touchdown.